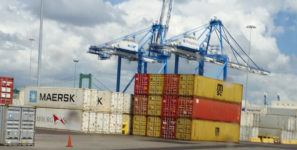 INTERNATIONAL INTERMODAL VOLUMES, DESPITE VOLATILITY, APRROACH PRE-RECESSION LEVELS: With container moves up and domestic trailer volumes down, intermodal finished out the third quarter with respectable gains. Joni Casey, CEO of IANA: International container trends are approaching pre-recession levels. The domestic intermodal trailer segment shrunk 3.1 percent Q3; domestic containers grew six percent. The seven highest-density intermodal trade corridors rose 3.7 percent in the third quarter. The intra-southeast corridor, buoyed by stronger imports, experienced intermodal gains of 20 percent. With month-to-month variations, intermodal growth of 3.4 percent in the third quarter of 2015 was in line with year-to-date results, according numbers released recently by the Intermodal Association of North America (IANA). The international market segment showed some volatility as its volumes climbed 3.3 percent in July and 6.4 percent in August, then slowed to 1.6 percent growth in September. The segment closed the quarter with a 4 percent increase, almost even with the 4.1 percent growth in domestic containers. A decrease in domestic trailer traffic brought total intermodal numbers down. The domestic trailer market segment shrunk 3.1 percent in a quarter-over-quarter comparison, marking the fifth consecutive quarter of dipping trailer volumes. This deflated the quarterly gains realized in total intermodal loads. However, September domestic container growth of 6 percent helped boost overall domestic numbers. The seven highest-density trade corridors, accounting for 66 percent of total intermodal volume, rose 3.7 percent this quarter, exceeding the industry average. Growth rates for each individual corridor varied widely. The intra-southeast intermodal corridor, positively affected by stronger imports and rising market share over trucking, experienced gains of over 20 percent. Meanwhile, south central-southwest corridor volumes decreased by 5.9 percent, with international particularly affected. Regional traffic growth was overall positive in the third quarter, despite significant losses in the south central region and slight declines in western Canada. The south central area’s 9.2 percent decline is largely the result of a fall in international shipments. The northwest and southeast regions countered with substantial volume increases in the quarter, rising 9.9 and 9.1 percent respectively.